What countries receive the most medical missions? We’ve added over 300 volunteer organizations to our database, all of which send short-term, primary care medical volunteers to Latin America and the Caribbean. Some are small church groups that operate a single annual trip. Others consist of dozens of university chapters. Still others operate hundreds of annual trips. A majority seem to be faith-based, although many of these welcome volunteers from all denominations. If you’re a prospective medical volunteer, you can browse our listed organizations here. Short-term medical service trips and the locations they serve in Latin America and the Caribbean. We are aiming to list any group that we can find that sends short-term volunteers to Latin America and the Caribbean. But several countries and regions clearly dominate. 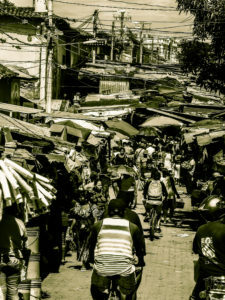 A disproportionate number of groups serve Central America, especially Honduras, Guatemala, and Nicaragua. In the Caribbean, Haiti and the Dominican Republic steal the show. 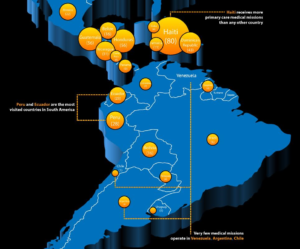 And the few organizations that travel to South America seem to favour Ecuador, Peru, and to a lesser extent, Bolivia. What factors make some countries so much more appealing for short-term medical missions to operate in? 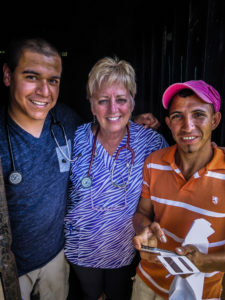 Countries in Central America are often only a short flight from busy North American hubs, making a volunteer trip a possibility for busy medical professionals who might only be able to schedule a one-week commitment. More developed countries like Argentina and Chile have less pressing need for the international aid that medical missions ostensibly provide. Meanwhile, poor countries like Haiti and Honduras are constantly in the public eye as worthy targets for humanitarian aid projects. 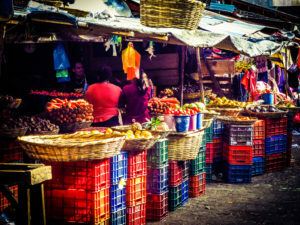 Colombia, El Salvador, and Venezuela continue to have a reputation for violence and political turmoil, despite dramatic improvements in public safety in the former. However, this fails to address why Honduras and Guatemala, with among the highest rates of violent crime in the world, remain so popular. In the current political environment, it’s not surprising that Venezuela and Cuba are not common volunteer destinations for US medical professionals. Furthermore, not every country simply allows foreign medical professionals a carte blanche to practice in their communities, and this is a good thing. It’s very possible that countries where medical missions are easiest to arrange logistically would receive the greatest number of trips. 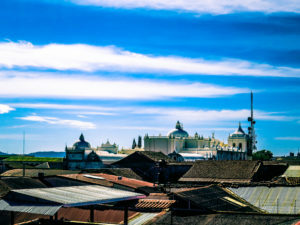 Can you suggest any other reasons for Central America’s dominance as a destination for short-term medical volunteers?